The rain came down in sheets but that did nothing to dampen the spirits of the more than 200 Sea Scouts and adult leaders in attendance at the awards ceremony of the William M. Minto Regional Rendezvous. 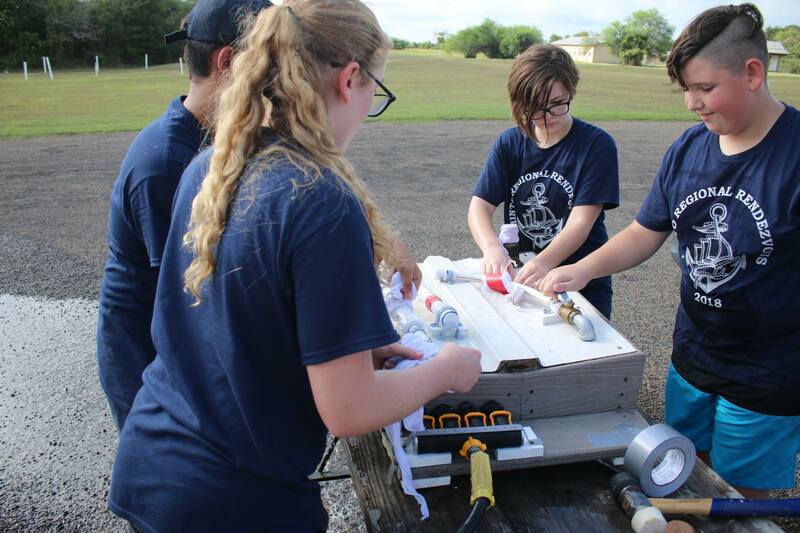 For over 35 years, Sea Scouts from all across Texas, and the Southern Region gather to compete in a series of nautical events that test a variety of a Ships abilities. During competition, Ships are tested on practical seamanship, discipline, their “book” knowledge about subjects such as Rules of the Road, teamwork and cohesiveness in a number of nautical events. The event is usually held mid-September, and this year fell on the weekend of September 6th – 8th. 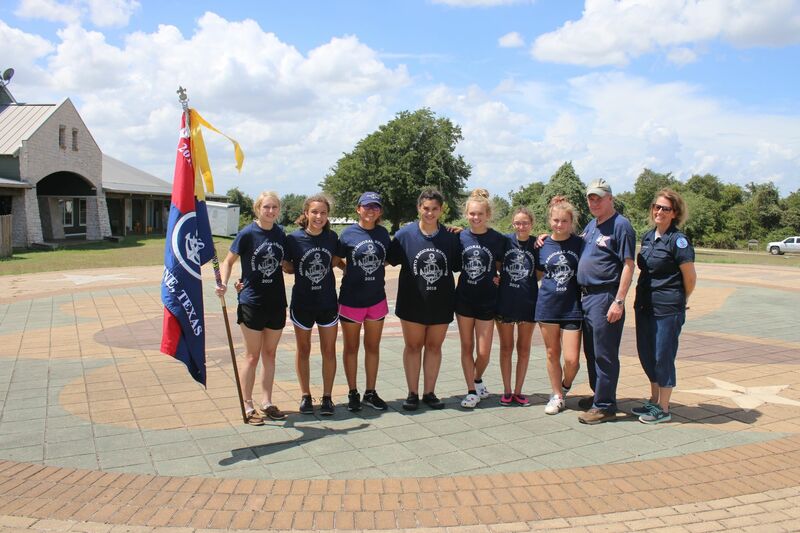 It is hosted at Scout Camps in Texas, and in the recent past has been held at Lost Pines Scout Reservation and this year was held at Bovay Scout Ranch in Navasota, Texas and was hosted by the Sam Houston Area Council Sea Scout Fleet, the largest in the nation. This year was a special one because in 2017, Minto had to be canceled due to Hurricane Harvey. It was a happy reunion and a chance to reconnect with friends and fellow Sea Scouts who had not seen each other in possibly months or even a year. Minto got started on Friday night, September 6th, with Ships trickling in that night and Saturday morning. They set up camp, and a Boatswains meeting and cracker-barrel were held. 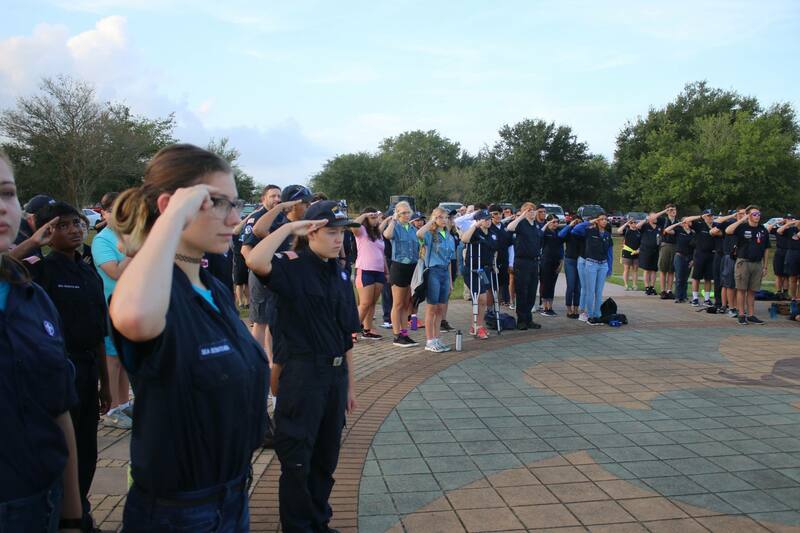 At the Boatswains meeting, Ship Boatswains were briefed by the event organizers and event Quarterdeck. At the cracker-barrel, Ships were able to mix and mingle among each other and build some of the camaraderie that scouts are famous for having. Saturday morning was an early one with reveille being 0600. Breakfast started with an opening prayer at 0700 and then morning colors were risen at 0800, with the Camp being in their Class B, or “work”, uniforms. Events got started right away at 0830, with Crews enthusiastically scrambling around the Camp trying to get to events as fast as possible. Some events were unique in that they had to be signed up for beforehand, during Breakfast, because of how long they took. Those events were First Aid, the Emergency Station, the Kobayashi Maru, and the Navigation Tests. The ES was a new event where scouts were given a box, about 3’ x 3’. It was covered with fiberglass boat deck and had several scenarios on it that challenged crew’s abilities to effectively conduct damage control. It had broken pipes, leaking valves, and holes that had to be corked. 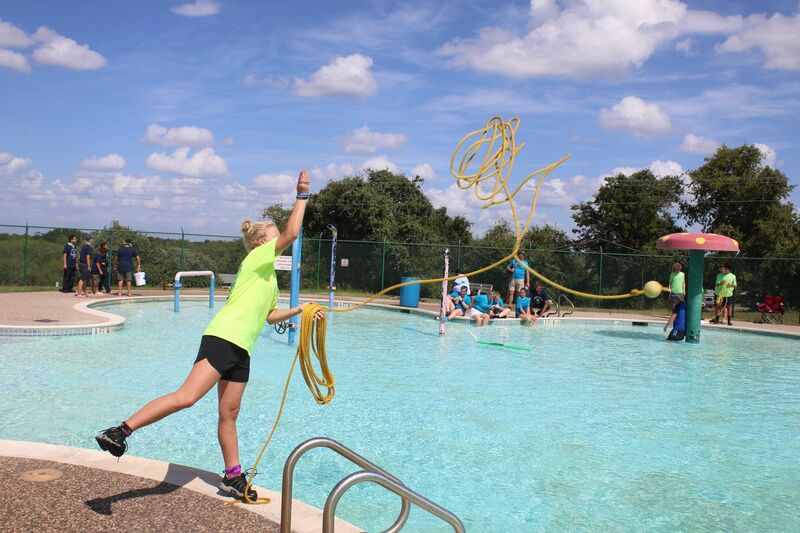 You were guaranteed to get wet and have fun doing it. The Kobayashi Maru is an event that tests a Crews ability to handle radio communications. It gives them a dashboard of controls like might be seen on a boat, including a functioning radio and a wooden panel where things like boats and obstacles can be placed to show the boat is approaching them. The crew is given an “unwinnable” scenario but must make the best choices possible as they negotiate it, in order to come as close to winning as possible. Each member of the Crew plays a role such as Navigator, Captain, Radio Operator and Lookout. At any time, a member can fall ill or be taken out. There are over 20 events at Minto: Clove Hitch around a Tree, Blindfold Sunfish Rigging, Double-the-Angle on the Bow, Blind Canoe Race, No Paddle Canoe Race, Boatswains Chair, Knot Tying, Marlinspike Seamanship, Nomenclature, Uniform Inspection, Practical Deck Seamanship, International Code Flags, Mariners Quiz, Barrel Fill, Heaving Line, Flotsam Flotilla and Life-Ring Toss. Each is very competitive, and many are very fun. After the competition as over on Saturday, the Ships gathered for evening colors and dinner. After dinner, the Flotsam Flotilla was held. 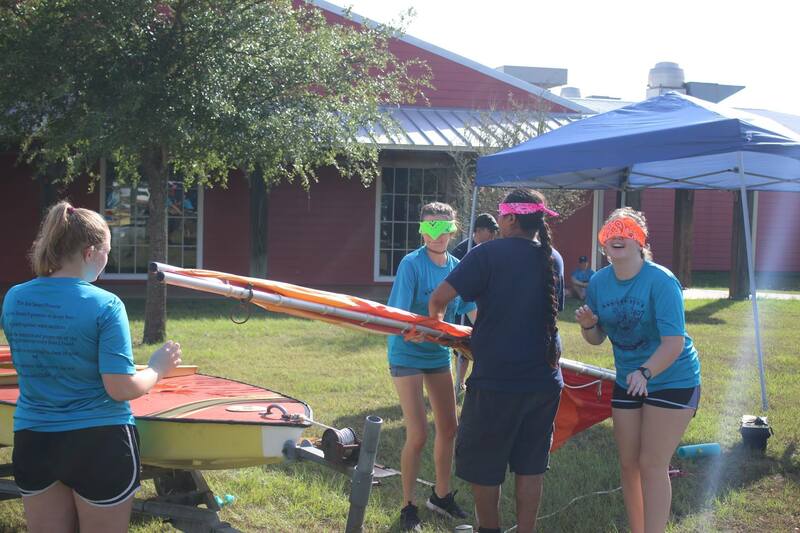 Every year, Ships are challenged to build boats out of odd materials. This year it was cardboard and duct tape. Afterwards, a skit competition was held among the Ships and snow-cones were provided. On Sunday morning, the Ships broke camp and gathered in their Dress Uniforms for the annual Uniform Inspection by the Regional and Area Officers. Due to the weather, it was held inside instead of outside and the colors were not raised or lowered. Southern Region Boatswain Ryan Trefny and Area 3 Boatswain Nick Kramer inspected the Ships as they stood in-ranks. After the uniform inspection, the awards were given out. 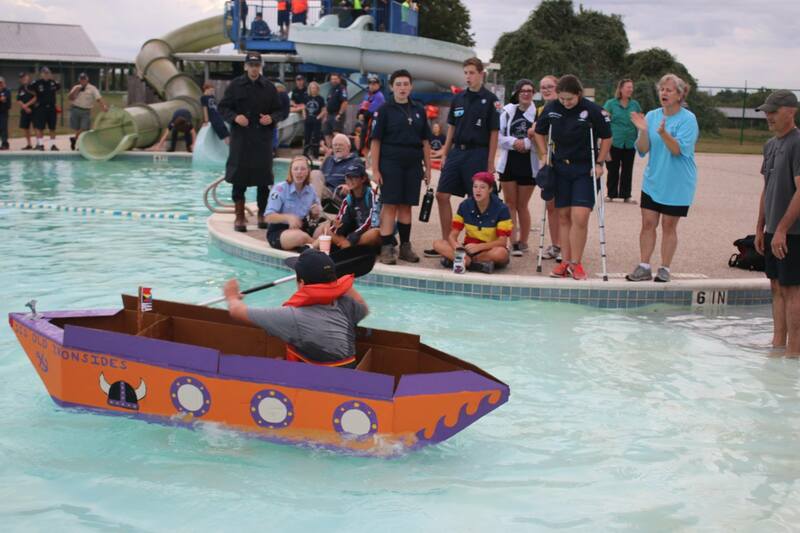 Sea Scout Ship 24, the Jolly Roger, from Houston, Texas, scored first overall at Rendezvous. Minto is a great event for all involved. It challenges Ship, provides a competitive environment for leaders to be tested and to grow, and it builds camaraderie and friendship among Ships and scouts. Everyone is already looking forward to Minto Rendezvous 2019!